"Unearthed" neutral systems are the PREFERRED network for marine installations (particularly shipboard), since it is disadvantageous to pass current through the hull material (which is the only available "earthing" plane). Even for rotating equipment operating on power electronics - it is not necessary for the neutral point to be connected directly to earth. However, it IS required that the neutral plane of the machine be connected to the neutral plane of the drive. We have to separate out the different applications and situations, such as line Transmission systems and site wiring etc. Neutral wiring should never float, as in being allowed to rise to some dangerous voltage relative to the Earth, people can touch. Normally Neutral should be securely Earthed at or close to source, that is supply Transformer, Generator or UPS. As in TN-C-S wiring systems. Yes there are some special applications, such as IT systems, where the source Neutral is either connected to Earth through a deliberately introduced earthing impedance or is isolated from Earth. (Quoted from the IEE regulations) But if isolated, then there needs to be suitable protection to prevent the floating Neutral from rising to a dangerous voltage and or compromising the insulation of the live wires to the PE Protection Earth. By definition, a Neutral wire is a potential Current Carrying wire, it may or may not be used in some systems. 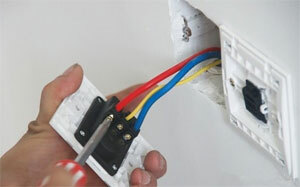 PE Protection Earth or Ground wires should not carry current, except when there is a Fault. In this context, "Earth" and "Ground" and "Tera", are exactly the same thing, so can apply to ships, aircraft, rockets and other planets. Being the mass that people can physically touch. So the Sea and ships hull become the Earth or Ground point. A TN-C system has a combined Tera, Earth or Ground wire with Neutral. TN-S system has a separate Tera, Earth or Ground wire from Neutral. IT system, the source Neutral is either connected to Earth through a deliberately introduced earthing impedance or is isolated from Earth. An unearthed... or otherwise known as a IT network, the star connection is not grounded, and so far as possible only delta connections are used in the case of transformers. You asked what happens during a ground fault, well nothing happens during a single ground fault as the potential of ground... which was irrelevant.... now is at the grounded phase potential. This however puts stress on the insulation of equipment and cable as the potential difference has increased by the root of 3. In this case an earth fault detection system should be in place to identify and alarm the fault. If equipment is rated for a IT network, there should not be insulation breakdown. If not, break down will occur. This or in the case of insulation failure due to other incidents, a 2nd earth fault might occur. In this case your system needs to be adequately protected and trip out on phase imbalance instantaneously. If this does not happen or your system coordination is not set up correctly flash, fire, loss of equipment and possible loss of life could occurs. These systems I work with on a daily bases and design for in the shipping industry.